Arctic Cooling is a brand name that should be familiar to computing enthusiasts. 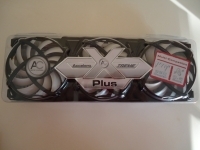 Their line of Freezer CPU coolers and Accelero GPU coolers put them on the map, and in this review we'll take a look at their latest GPU cooling solution, the Accelero XTREME Plus. The Accelero XTREME Plus takes the same thermal technology used with the award-winning Accelero S series, and adapts it to be compatible with the latest generation of graphics cards from both the "red" and the "green" teams. The promotional image above gives you a sneak peek at this universal VGA cooling solution. 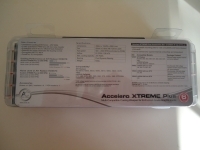 Before taking a closer look at the sample provided for review, let's check out some of the published data on the Accelero XTREME Plus taken from the official product page on the Arctic Cooling website. The Arctic Cooling Accelero XTREME Plus arrived in the same clear, protective shell you are likely to see on your store shelf. They did a great job of keeping the packaging to a minimum and thus allowing the product to sell itself. Aside from the two small labels, the entire package is clear in order to show off the cooler. Flipping the product around, you do get a quick breakdown of the features, specifications and which accessory kits you'll need for which graphics solution you'll be using.